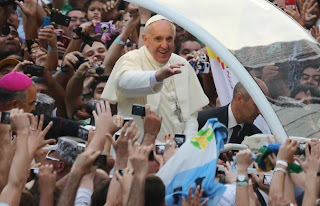 the spirit of charity: Pope Francis --the Jesus Rockstar! Pope Francis --the Jesus Rockstar! Now picture Jesus along the shore calling the fishermen to follow Him. Without reservation they did the "Come and See" thing. Do you have that kind of faith and courage? Ask and you will receive! “Do not be afraid of what God asks of you! It is worth saying ‘yes’ to God. In him we find joy!" What is God’s plan for your personal fulfillment? On what path will it take you? How will you reach out now to those most in need? How will you do it through your vocation? The Lord tells us more than anything else in the scriptures “do not be afraid.” Listen, and take a step to answer the call you hear, do not be afraid. God’s love, grace and mercy are abundant—be not afraid! Did you hear/read the Pope’s homily for the Mass with Seminarians and Novices? Check it out! "What do I expect as a consequence of the Youth day? I expect a mess. There will be one. There will be a mess here in Rio? There will be! But I want a mess in the dioceses! I want people to go out! I want the Church to go out to the street! I want us to defend ourselves against everything that is worldliness, that is installation, that is comfortableness, that is clericalism, that is being shut-in on ourselves. The parishes, the schools, the institutions, exist to go out!" "Do not be afraid!" When we go to proclaim Christ, it is he himself who goes before us and guides us. When he sent his disciples on mission, he promised: "I am with you always" (Mt 28:20). And this is also true for us! Jesus does not leave us alone, He never leaves you alone! He always accompanies you. So, are you a Pope Francis fan? If so, how will you follow Jesus's call to seek out those most in need and do something to show Christ's love? ?